We walk together with you! Facing dispossession, using our way of organizing ourselves in our space, with each slow step we take in this struggle we name ourselves as N’guixo people. Last April 30, Miguel Ángel Peralta, a member of the Community Assembly of Eloxochitlán de Flores Magón, Oaxaca, was arrested at his workplace in Mexico City by plainclothes agents without an arrest warrant. He was held incommunicado for 20 hours before being presented at the Tlaxiaco prison in the state of Oaxaca. On the ride down, he was beaten and threatened. Since 2010, Miguel has struggled alongside other members of the Community Assembly against the imposition of the illegitimate Mayor Manuel Zepeda Cortes, who rejected the council members elected according to traditions and customs and set up his own government, bringing a reign of terror, plunder and injustice to Eloxochitlan. 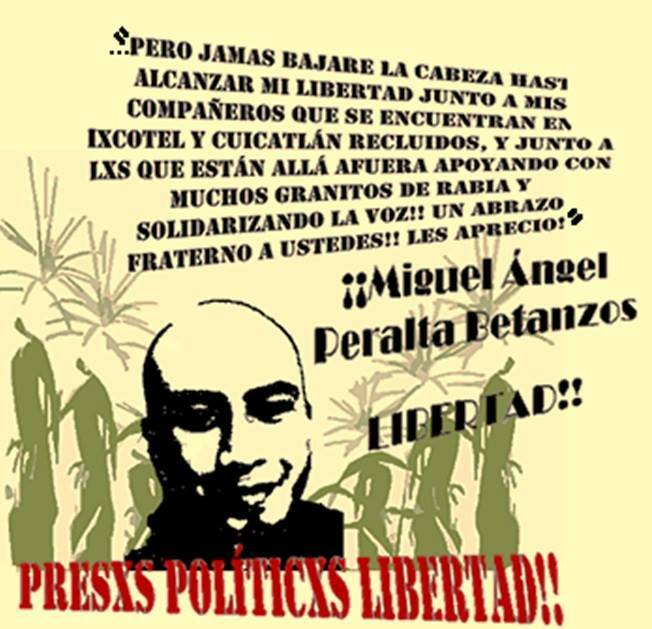 On August 10 2012, Miguel’s father Pedro Peralta was kidnapped, tortured, seriously wounded and locked up in the Cuicatlán prison, where he is still held as a political prisoner for having struggled against the tyranny of the Zepeda Cortés regime. Our struggle in Eloxochitlán seems very small alongside the other struggles developing in Oaxaca, in the country or in the world. But it is just as worthy as we fight and resist the enemy: the state and its lackeys. In Oaxaca, we salute and walk together with our Ikoots and Biniza brothers and sister who resist in the Isthmus against the wind farms and the dispossession of their territory, including the wind; to the peoples raising their voice in order to not be flooded by the Paso de la Reyna dam; to those who refuse to allow the AHMSA mine to reopen in Santa María Zaniza; to our friends from Xanica, to the squatters of the Alemania estate who have been able to reclaim their lands and who oppose the selling of their water in tourist “development” spaces (Huatulco); to the voices that slowly rise in the surrounding villages of Cuicatlán in the Cañada against the Canadian businesses who want to exploit their hills that contain gold; to the libertarian comrades who have long resisted in the main city and its surroundings. In Mexico, as well, to those beings who rebel against the state and shout that the water belongs to all; to the warriors of Óstula who fight for their natural resources and against the narcogovernment; to the Totonacs and Nahuas of the Sierra Norte in Puebla and the Tiyat Tlali Council who raise their fists against Chinese businesses, hydroelectric power, fracking; to the peoples of Morelos who refuse to be displaced from their territories for the construction of pipelines; to the Wirrarikas who have resisted displacement from their sacred spaces; especially to the libertarian comrades who resist daily in the asphalt jungle, building autonomous spaces, sharing knowledge, exchanging, breaking barriers, creating individual and collective ways of living without bosses or parties telling them which route to follow; to the enahana group; a hug, comrades. In the world, we salute the Mapuches and their ancestral fight for their territory and who fight daily against the police; to the Greek comrades who rebel against capitalism, improvise and seek out new forms of economies of solidarity and autogestion; to the French comrades of the ZAD who with much rage reject the Notre-Dam des Landes airport project. To those without roofs, without territory, without papers, to the political prisoners of the world…those that resist capitalism, power and its multiple forms. We walk, we struggle and we resist against a group of powerful criminals who pose as victims in different forms: they call themselves democrats, enlightened ones bringing “progress and development,” faithful and respectful of their fellows, defenders of human rights and dedicated professionals. I now ask myself then if democracy means imposing a form of government through political parties? Ah! Yes, it is, and so clearly they are democrats. This government has nothing to do with what we believe and how we organize, building consensus in neighborhood, district and community assemblies, reaching agreements together, not imposing them. They call themselves professionals because the knowledge they sell in private universities they use to peddle influence in local and federal governments, managing projects and, well, you know he who divides up the pieces keeps the biggest piece. They know the graft issue inside and out, and that negotiating with the municipality is much more rewarding. Defending human rights? If human rights mean being violent to people, now including even using the state police to intimidate the people of the community they are “defending”; if to defend is to destroy the social fabric, to torture those who do not believe in their political project and for belonging to the community assembly; if to defend is to raid houses in neighborhoods like Cebollín using the army, then yes, it is clear to me which human rights we are talking about, those that serve the people above, in power, in order to justify their actions and abuses. The resistance we are uncovering in our very own way is done using, and in order for, our communal, assembling ways to be respected, where our voice gains value collectively; against the exploitation of the few natural resources that we take care of, such as the Petlapa river, because they have plundered it, our forest, our mountains that protect the space we inhabit and which we shared before you defenders assaulted us, harassed us, and displaced us. Facing dispossession, using our way of organizing ourselves in our space, with each slow step we take in this struggle we name ourselves, recognize, self-identify ourselves as N’guixo people who walk alongside our sisters and brothers in other struggles. This has just begun. Their bars will never silence us! May the river gallop and the mountains’ heartbeat rumble! Release the prisoners to the street, the conch of the caracol calls!